My brewer’s bond has been approved! (This bond is so the Feds are guaranteed that the taxes on the beer will be paid) I’m just waiting for it in the mail and I can continue to work on the Federal application and possibly submit this week. Though I felt like an idiot when I logged back onto the Fed website and discovered a little dropdown labeled ‘Cash Bond’. I surely would have done that and just wrote them a check directly and saved a month! This does put it firmly into December for opening following the current Federal processing timeline – though it did save some money. It’s ok. It’s going to allow more time to get things done right and not rush this process. My wife has done lots and lots of research on flights and how people serve them and what people seem to like as far as quantity and size. A lot of this research also came from your great feedback here on Facebook. We have narrowed it down to a few options and will start making some ‘flight prototypes’. This was our major project this week. After consulting with my dad and with my wife’s input (she knows I’m messier and drop things more than I think I do based on the homebrew pilot system), we figured the best thing to do was to remove the existing floor down to the concrete and leave it like that…no retiling or anything. I shouldn’t put ‘yet another layer’ over top. I lined up Assistant Brewer Jesse and Marketing and Taproom Hostess Rebecca to come down to help. I got my Dad and John over too. After doing some research on vinyl tile/thinset/carpet removal (thanks Rebecca and Denny! 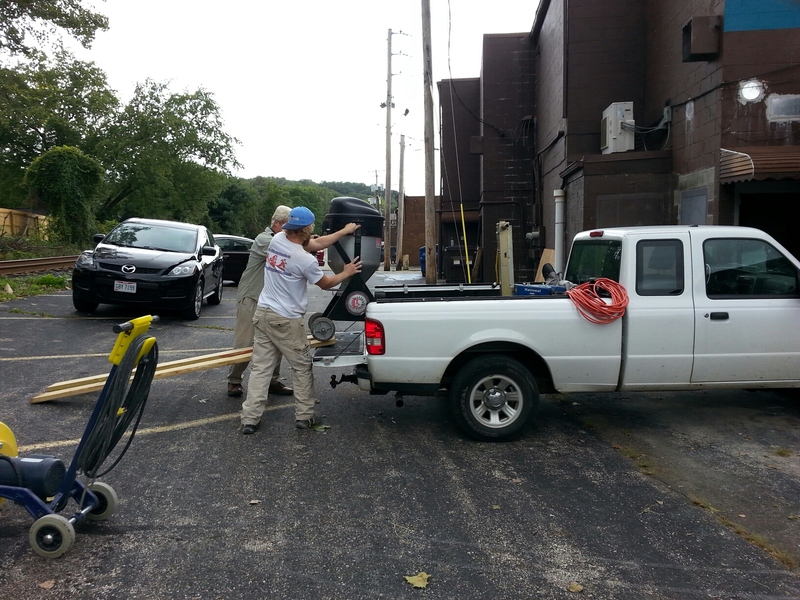 ), I called Jordan Power Equipment in Tallmadge to rent some tools to get the job done. This was not a job for just a hammer and a chisel, I needed scrapers and grinders. I rented equipment for only 24 hours as it wasn’t cheap. We had work to do! I can’t say enough about Jordan Power Equipment and the guys and gals working it. Top notch all-the-way and very helpful. They are even ‘on call’ 24 hours a day if you have problems. 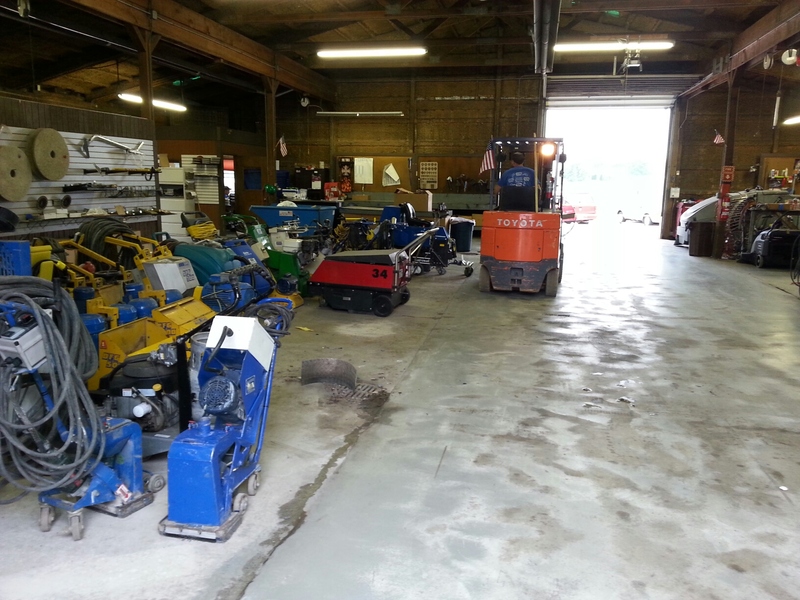 Jordan Power has all the industrial concrete tools. Yeah…we filled up our Rendezvous. 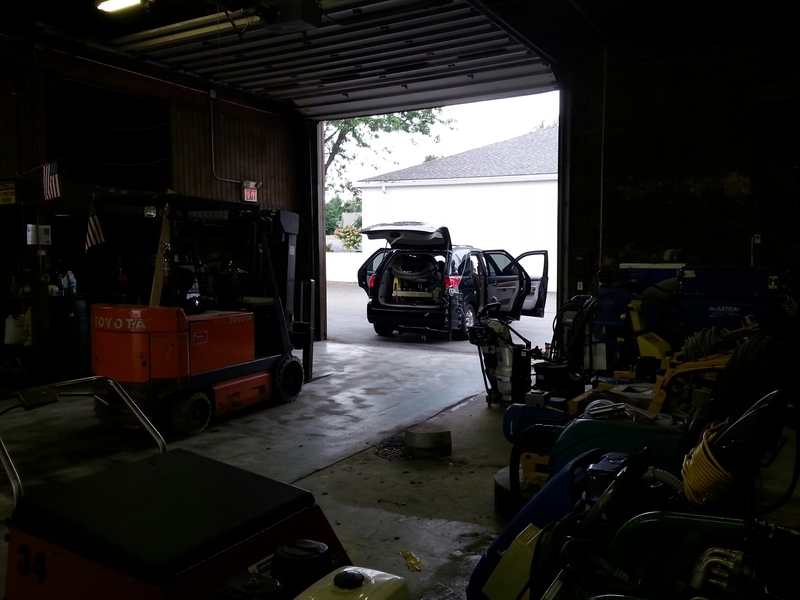 We started work later in the evening to not disturb any adjacent tenants as these machines aren’t exactly quiet. 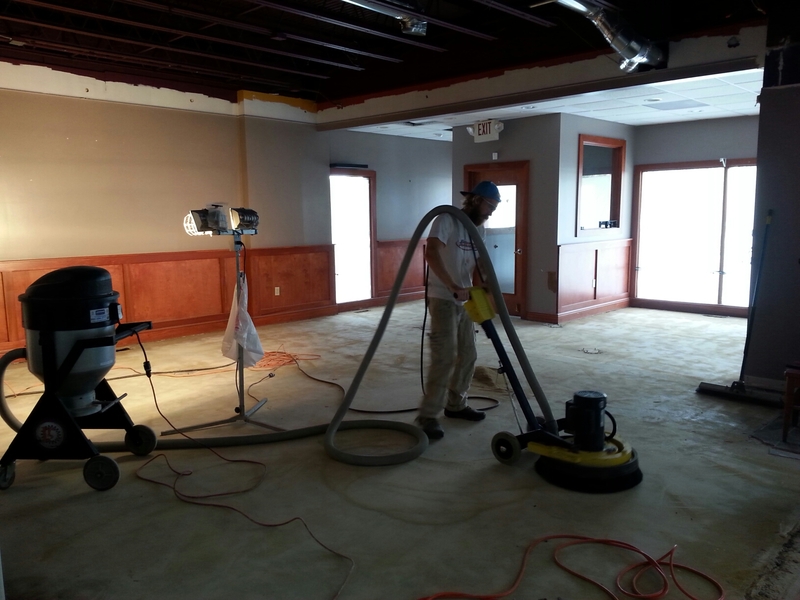 We started with the vinyl tile remover to get us down to concrete. Another awesome machine, the ‘Ripper Stripper’. This beast is 300lbs and self propelled. It has a vibrating blade to pull up tile and glue. In this case we had thinset from an upper layer of ceramic tiles FIRMLY glued to the vinyl tile under it FIRMLY glued to the concrete floor under that. Slow work even for this machine. 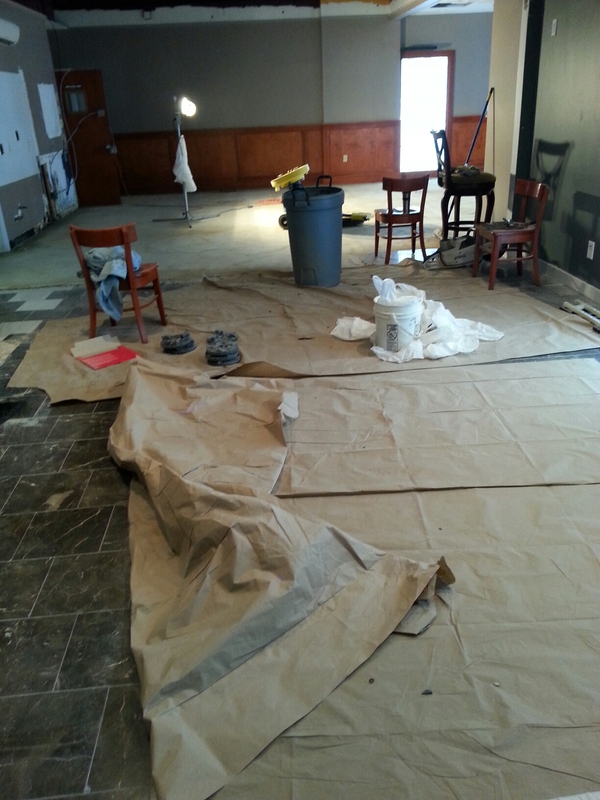 This area (the brew area) has two layers of vinyl tile. It was tough going even with our cool tile machine. This is my Dad and Jesse. 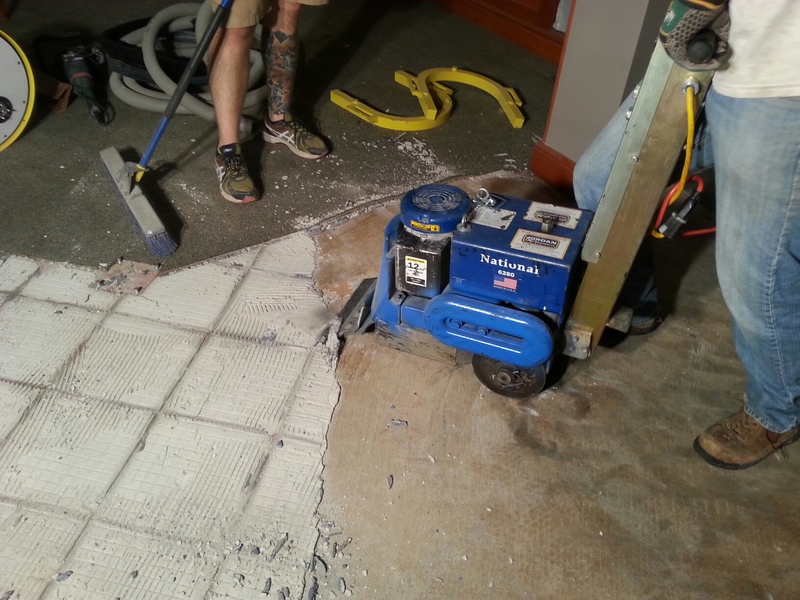 This machine didn’t want to do two tile layers at once, so we had to take it off one layer at a time. The top layer was difficult as the blade wanted to dig into the bottom layer. Ideally it’s used for one layer of vinyl tile on concrete. 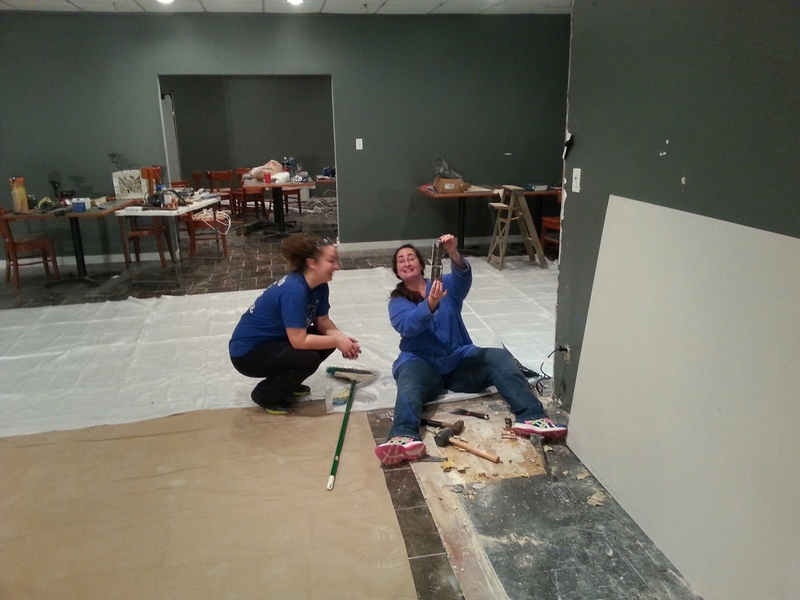 The best way we found to remove the carpet-on-vinyl tile was to do it one thin strip at a time…and pull hard! My Dad and John. 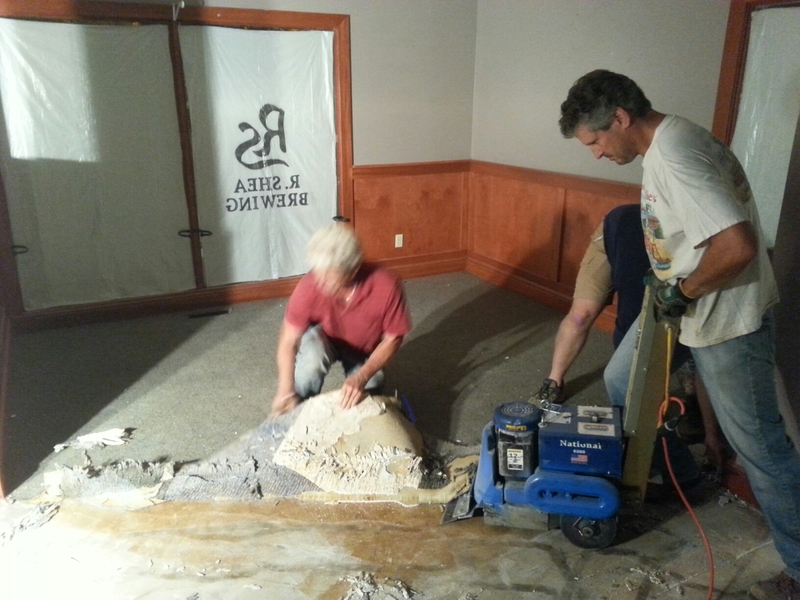 We thought the carpet would be easy to remove, not so even with the vinyl tile remover. 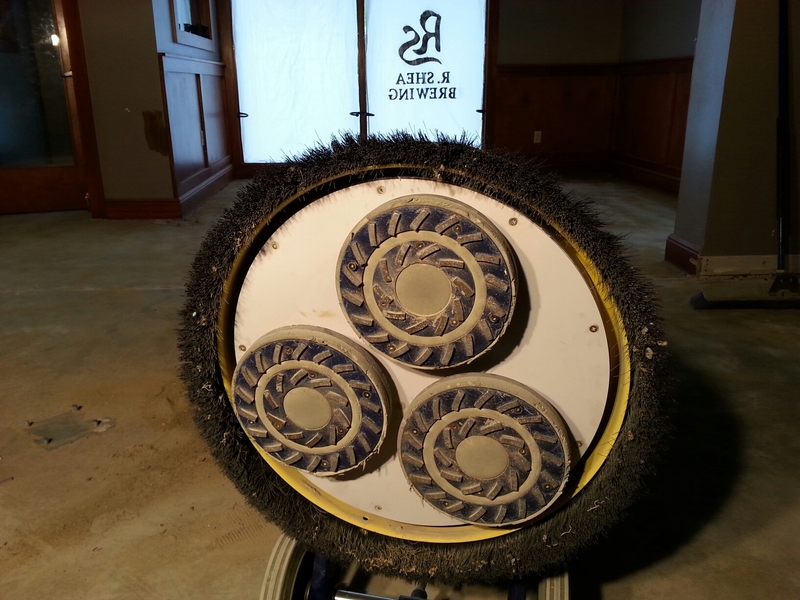 This is one awesome machine…diamond blades to cut through mortar and concrete hooked up to a vacuum for no dust. 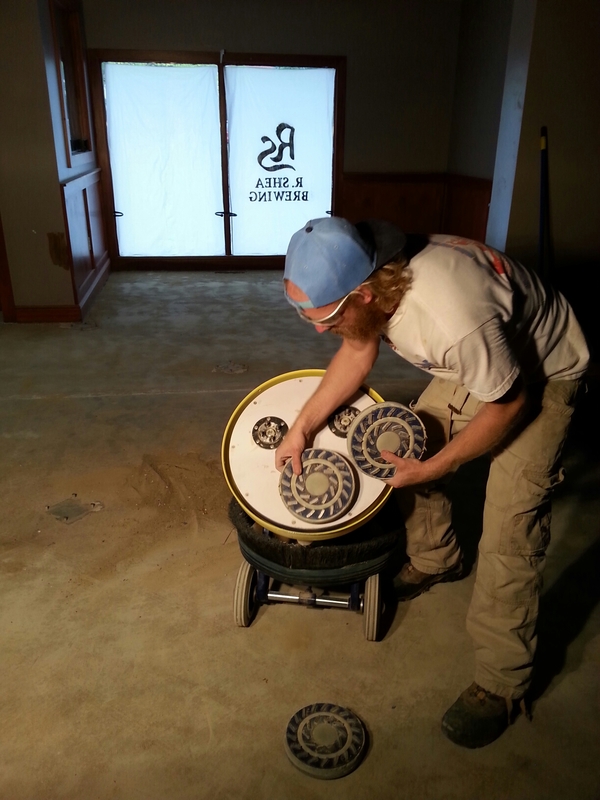 This is the concrete grinder that comes with multiple types of blades to get a nice finish. 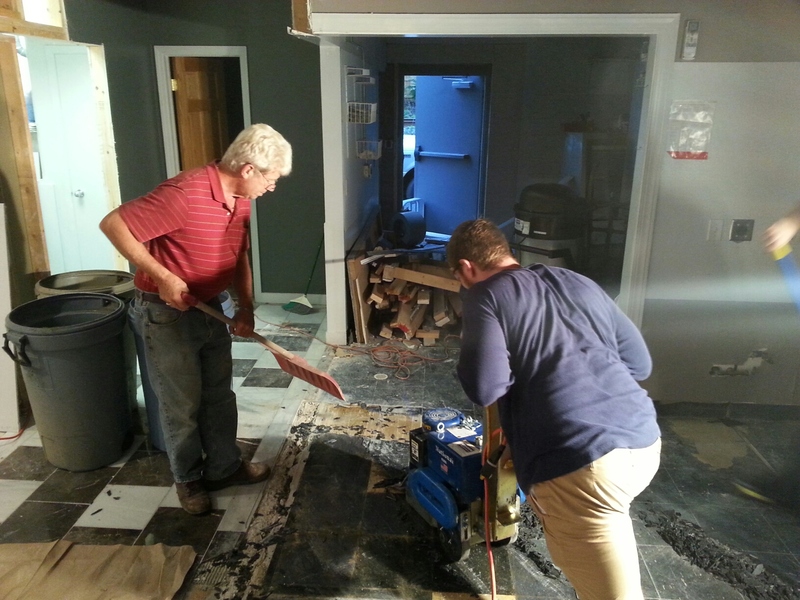 This once, multilayered floor of tile and linoleum squares is gone! My wife and Rebecca figured out how to remove the existing marble floor without breaking the tiles. About a 60-75% success rate. This is where the fermentors will go. 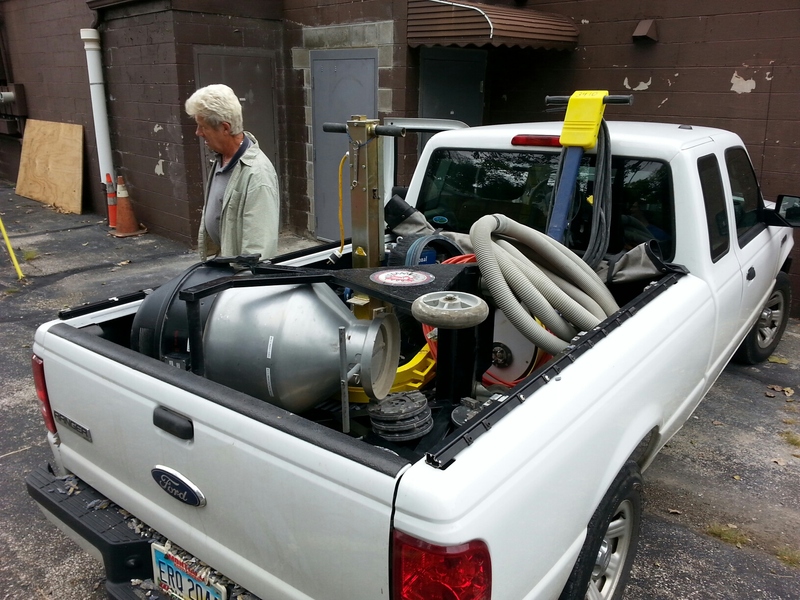 It’s much easier fitting this equipment in a truck-bed then a minivan. It’s a done deal! Thanks Jordan Power! MASSIVE THANKS to my Dad, John, Jesse, Rebecca and my wife for the work on this night. It was 5 hours of grueling work but we got it done. It couldn’t have been done without all of them. I finished up the concrete polishing the next day. Jesse actually got up to go swimming early the next morning. Beast. I skipped my swimming workout. Loser. 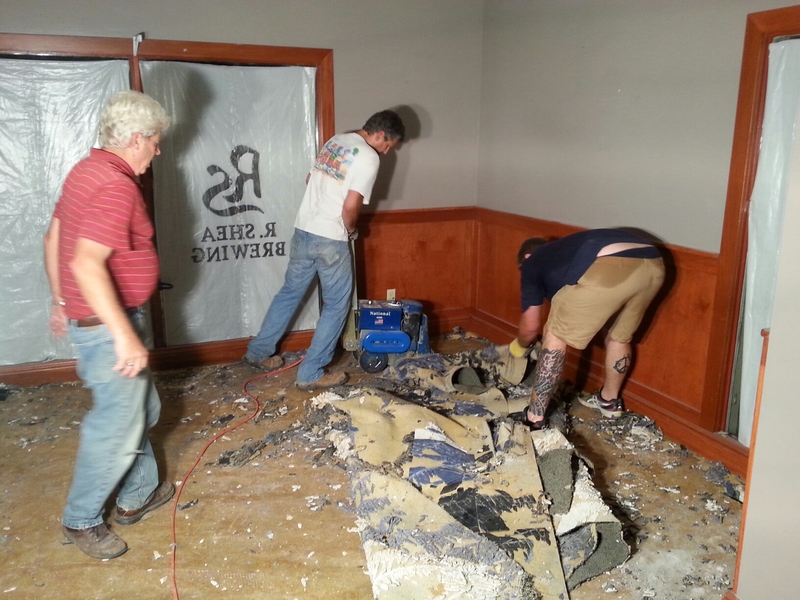 Recovery and my wife, mostly, will work on removal of some of the marble tiles that will be behind the bar. We want to reuse them in another area. Slow, tedious work than anything. We need this finished this week so I can rent the concrete polisher one more time to finish the area, apply a sealer and be ready for fermentors in 30 days. 30 DAYS!